This weekend we apparently did not have a blizzard. It was not a blizzard because Environment Canada didn't post any weather alerts that it was a blizzard, although given the fact that it seemed to have met all of the conditions for a blizzard in terms of windspeeds and visibility, I wonder if someone just forgot to update the website. As someone who actually went outside and walked through it, it certainly felt like a blizzard. And from the way the trucks were getting stuck in the snowdrifts that were piling up in the middle of the road, I wasn't the only one that noticed it. Driving through nearly zero visibility conditions was perilous (but also kind of a fun adventure). The next morning, the sun was shining but the blowing snow continued, giving everything a rather surreal feel, like we were walking on another planet. Last week things actually seemed to be warming up a bit. 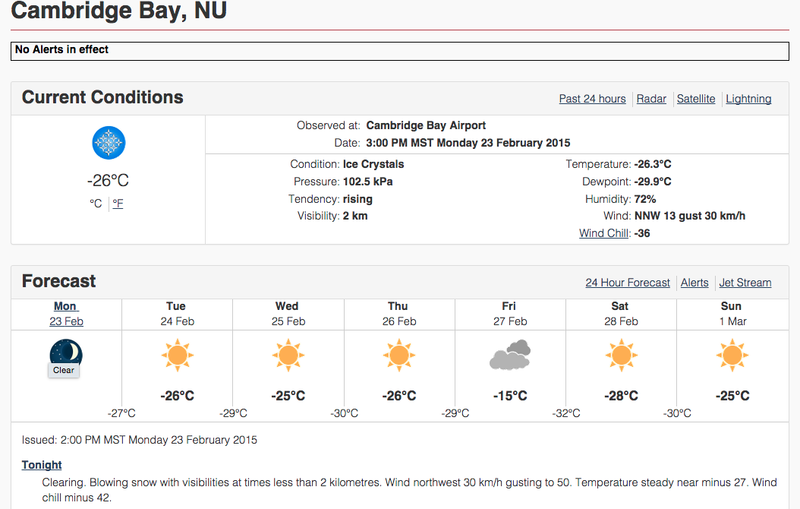 On one day, my friend in Oakville, Ontario informed me that it was colder in Oakville than it was in Cambridge Bay. Of course, at that point, Ontarians were screaming bloody murder about frostbite while Nunavummiut remarked on how pleasantly warm it was at -30 rather than -55. Perhaps spring is coming after all. Perhaps. Meanwhile, as the day gets longer, we are getting some beautiful skies.